Sunday morning the sun was out early. Doug would be joining me on my first Pacific Ocean loop of 2014. The Ducati is ready! Because one of my neighbors’ cats picked the Ducati as a territory marker (he has done it twice – forcing me to wash the bike each time to get rid of the stench and to protect the bike from corrosion) I now have to set the bike up inside the garage, closing the door when I’m not there because he shows up out of nowhere to do his deed. I’m researching (google, of course) ways to prevent that behavior, but I already learned it is a difficult and practically impossible task. I’m thinking a battery operated low voltage electric fence, like the ones used with cattle, at the right height around the bike should do it without hurting the cat. Maybe it is too much work. What about pine-sol or citric oil on the ground by the garage door or around the bike when it is outside? I’ve also heard that once a marking spot is established, cats never let go of them, and other cats start using that spot as well. Rest assured I’m not going to go as far as this guy on the video below went to stop cats from marking on his car. It is worth a watch! (no cats were “damaged” in this “humane” process, I believe). Cats aside, the day was promising, weather forecast mentioned a dry Sunday in the area and coast. 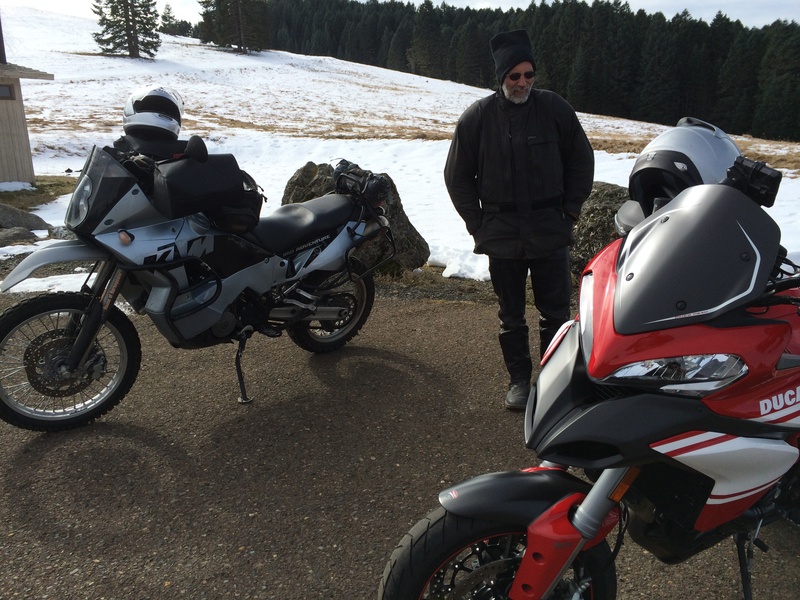 Doug showed up and we took the bikes to the gas station to top them off with non-ethanol gas. My plan is to ride enough miles to use most of the gasoline in the tank and then get a full tank of new, fresh, non-ethanol gasoline. 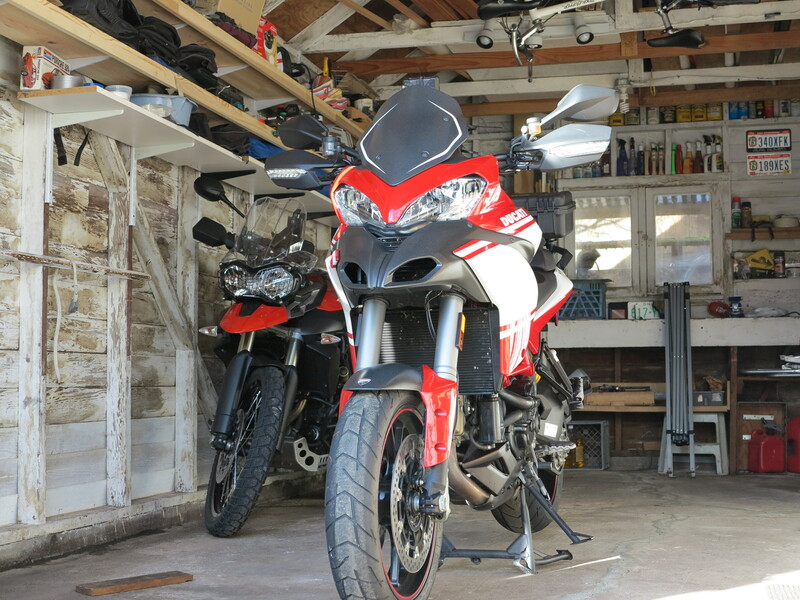 Two things I noticed on the bike, after being in storage for four months. First was the start button getting stuck on the depressed position. To bring it back I had to remove the gloves and dig it back by its edges manually. Ducati has sent me a new button, but it has since been back to normal operation by itself so I won’t install the new one. Start button getting stuck on the “pushed” position. The second thing was condensation on the main dash area. It went away at some point during the day (here it was already going away, only around the RPM numbers between the 2K and 9.5K numbers). But it came back on the next ride (yesterday) and also went away during the ride. I’m not too concerned about it, soon it will be dry enough that it won’t be there again. But it worries me if that will happen every winter, as I fear eventually it will damage the dashboard. 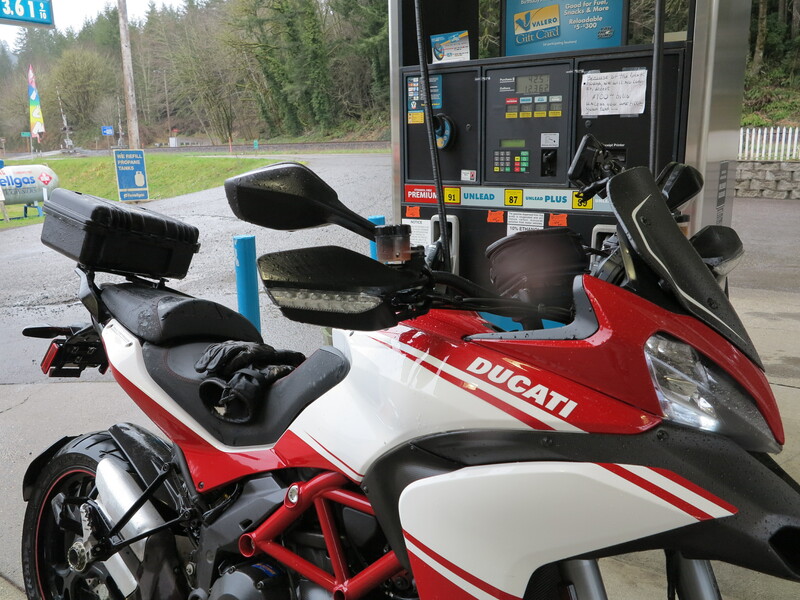 From the gas station we rode 99 north towards 34 and from 34 we went west towards Alsea. 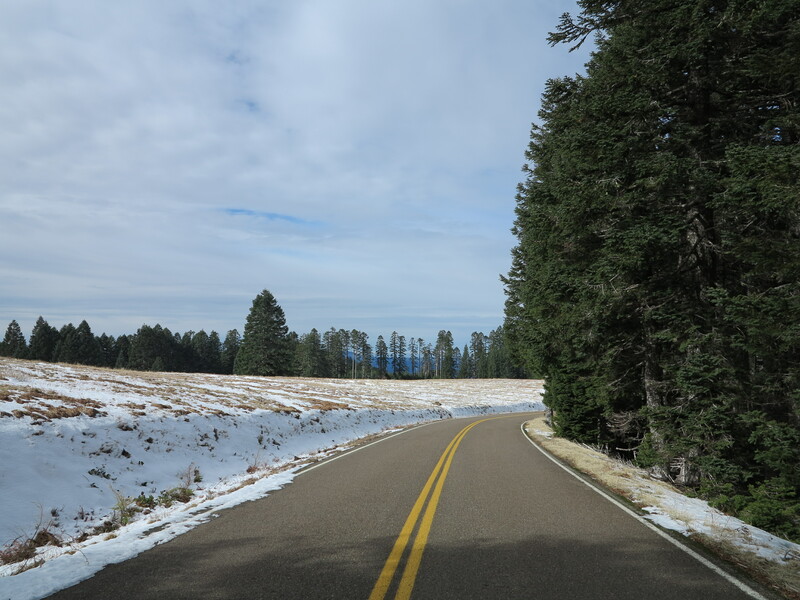 It was not raining, but most roads were wet in forested areas. 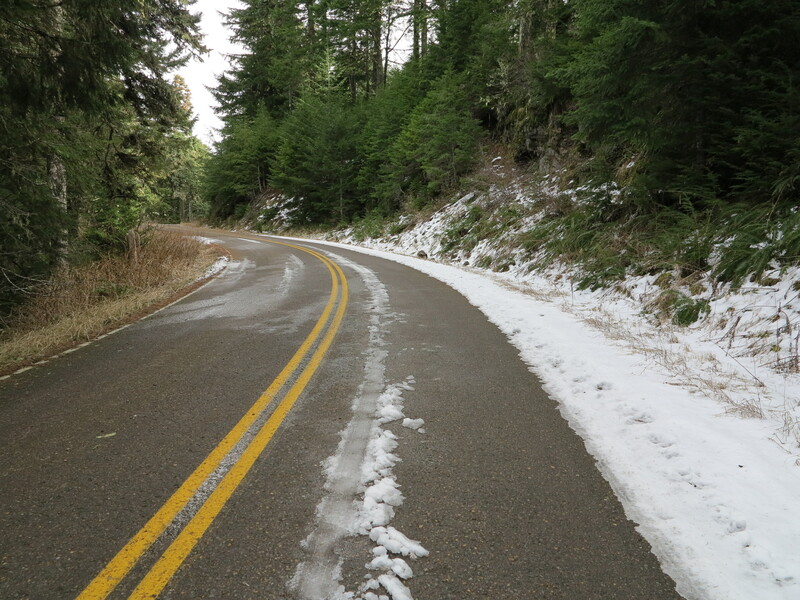 We made a detour to Mary’s Peak and the road had probably just been opened for the season. It was covered by a real mess of branches, leaves, gravel and water. Closer to the top, there were patches of snow to make things yet more interesting. Doug climbed that mountain like a maniac. By the time I got to the parking area at the end of the road, his bike’s motor had probably cooled down already. 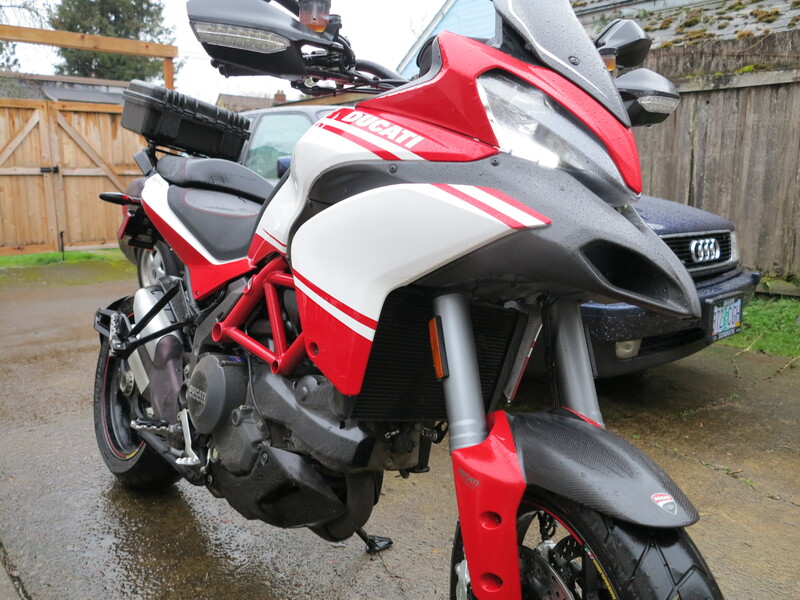 I don’t know how he manages to ride so fast on treacherous pavement conditions but then slows down on dirt roads. He probably thinks the same about me, but on reverse, how do I ride faster then him om dirt and chicken out on pavement under certain surface conditions. The views were really clear. Sisters and Mount Bachelor at the Cascades. It was cold up there, just above freezing. 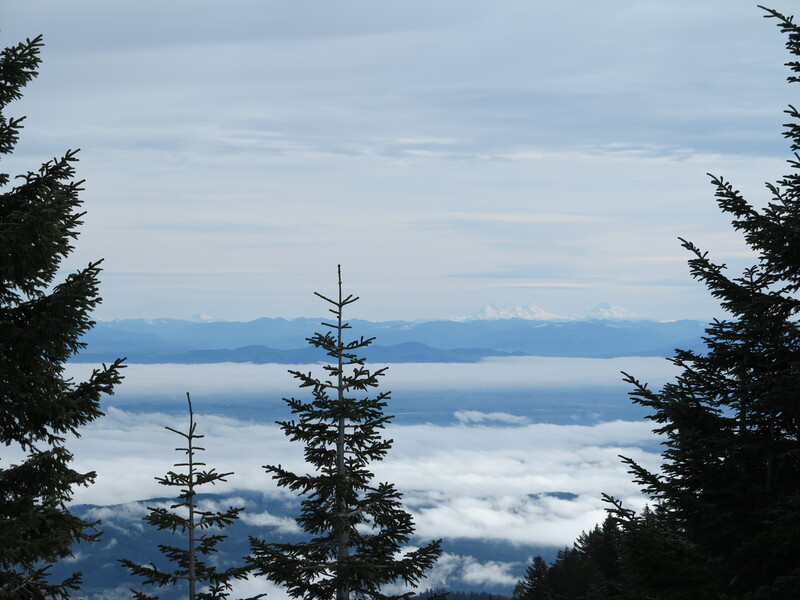 We went down the mountain, towards Alsea. 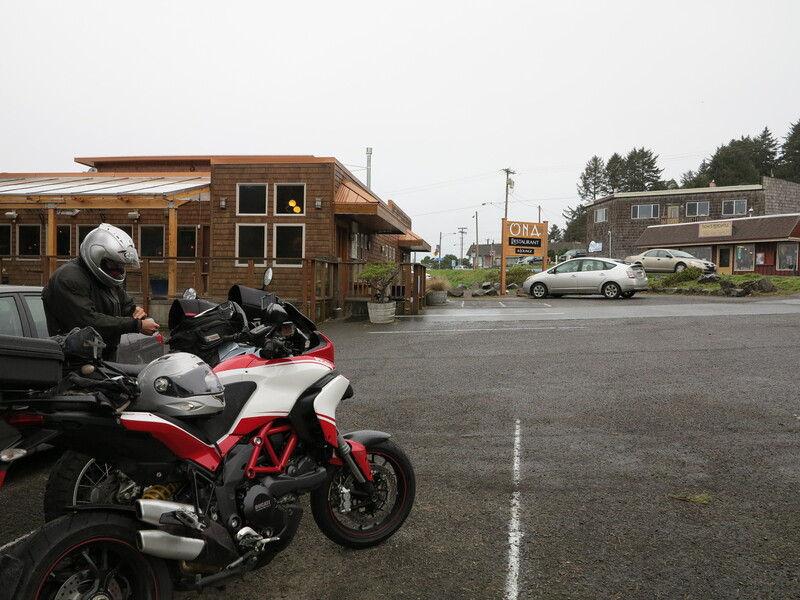 Doug suggested we had a cup of coffee at Deb’s Cafe in Alsea. Good idea to warm up our hands on a hot coffee cup and stay indoors for a little while. I had started with minimum heat on my hand grips, by the time we stopped at Deb’s Cafe at had it on medium. On my way back from the coast I had it on maximum. We met two fishermen at the cafe, working their way to get steel head trouts. Once they heard about my connections with Brazil they wanted to know about fishing over there. I recommended Argentina to the south, instead, for fly fishing. They talked about expeditions in the tributaries of the Amazon river, a completely different experience than fly fishing in southern Argentina. I’ve never been to the Amazon region in Brazil except for an airplane fuel stop once, and it was at night. 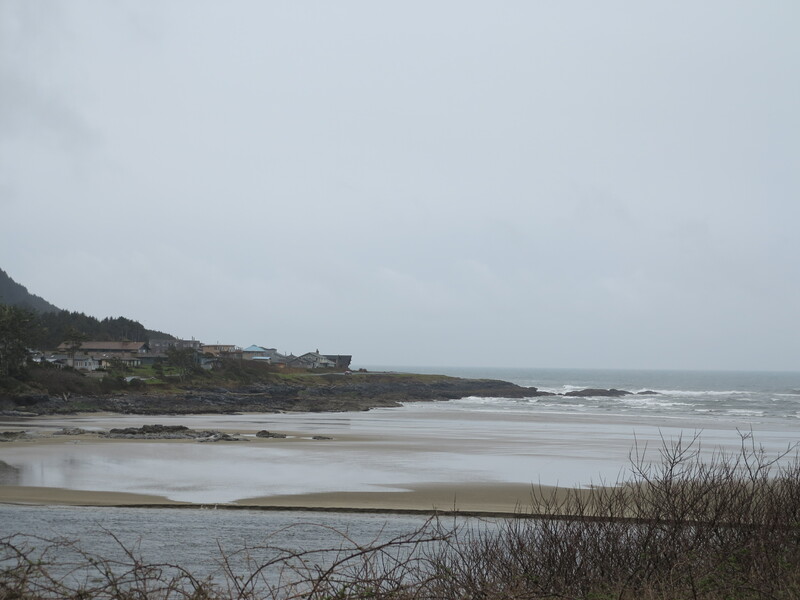 We continued our journey towards the coast and eventually found our way to Yachats. We had lunch at the Ona restaurant, where else. When we left the restaurant we encountered persistent rain. Great weather forecast, where is the “promised” dry Sunday? Nothing to do but carry on. 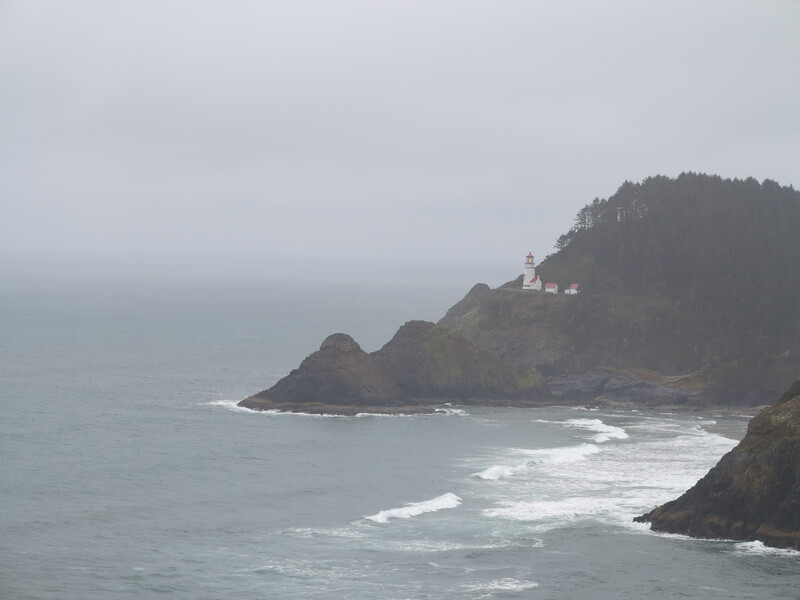 We made a stop at the Heceta light. Now it is the “getting wet” type of rain as it is really coming down. 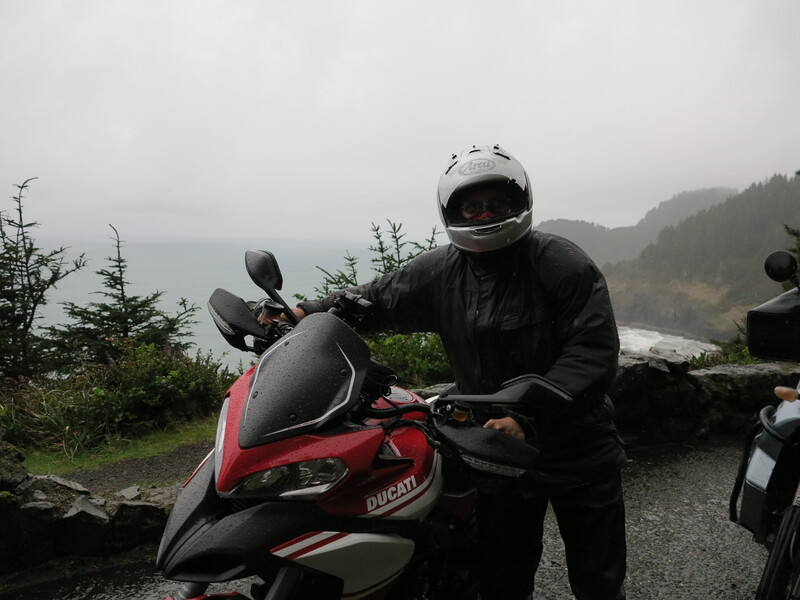 And Doug pointed out to me that he does ride in the rain (a remark from my comments on two of our last Steens adventures). Well, he really doesn’t like riding in the rain on dirt roads. And you know, between you and me, he is right. Anyway, he has been hinting that he wants to ride my Ducati and complaints I’m not letting him ride it. He already rode one bike exactly like mine when we tested the Multistradas 2010 and 2013 back to back in February 2013 (it was reported here) so why bother riding it again? If he buys the KTM 1190 (which he talked about in the past weeks and now he dismisses it) I will gladly exchange bikes with him for at least one entire leg of one of these rides. That would be a fair exchange wouldn’t it? 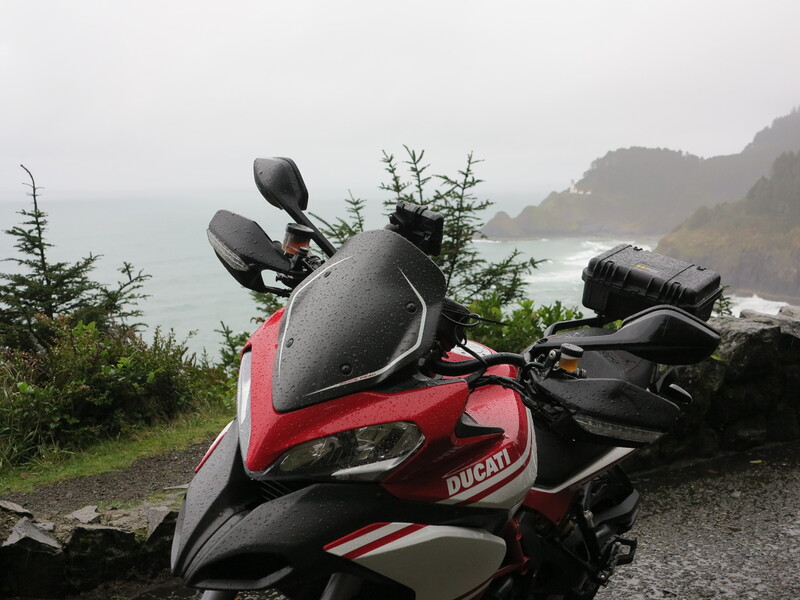 Anyway, there we were, the wet bike and the Heceta Lighthouse. And it was nice to see it working on low visibility, how lighthouses are designed to operate. We continued south under steady rain to Florence and from there we went east to Mapleton where we stopped for “clear” gas as some people call the non-ethanol gas. Soon we were on 36 for the home stretch. The further from the Ocean we got the less rain we encountered. I got back home at about 5 pm I believe. It was great to be back on the saddle. The bike performed really well. 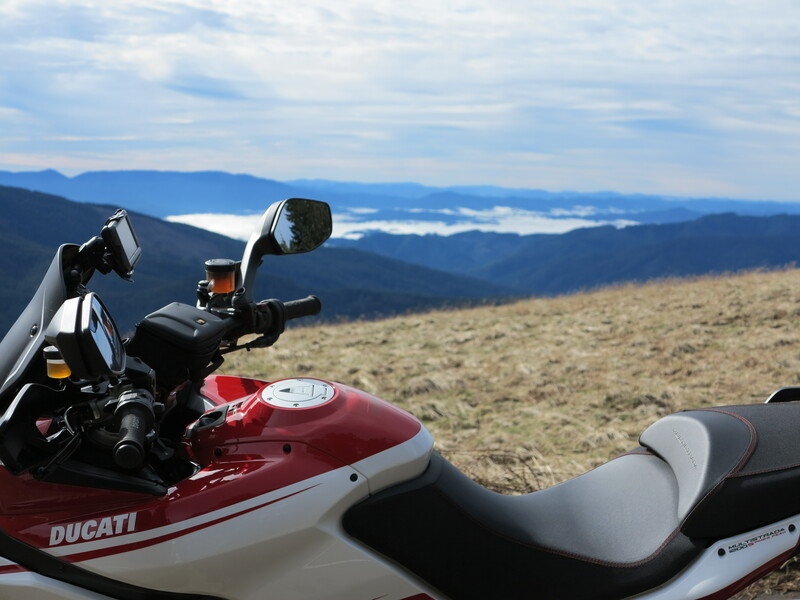 This ride took place in February 2014, and it was a great reminder for why I got this bike in the first place. This ride was long overdue, since, except for the few miles the day before, I had not ridden since October 2013, which makes about 4 months without riding this winter! Well, at least I’ve been riding my bicycle to and from work. Next will be the ride I did yesterday, with Doug and Ricardo. Same loop. The weather is slowly getting better, although we stay in the valley during Spring and Fall thus saving the coastal trips for the heat of Summer. We had a great ride yesterday touring Marcola Rd., Hill Rd., and McKenzie View Rd. to fetch a couple more covered bridges on our list. Hey Troubador, thank you for bringing up the Scarecrow motion activated spray. I did a quick internet search and there it was. 🙂 I think I can make use of it for my bike protection and better yet, for them to re-think their usual walkabout routes that include my driveway and my back yard. If I buy and install it, I will make a video of the action and post it here. 1. Have you eaten at Luna in Yachats? Pretty tasty seafood. 2. 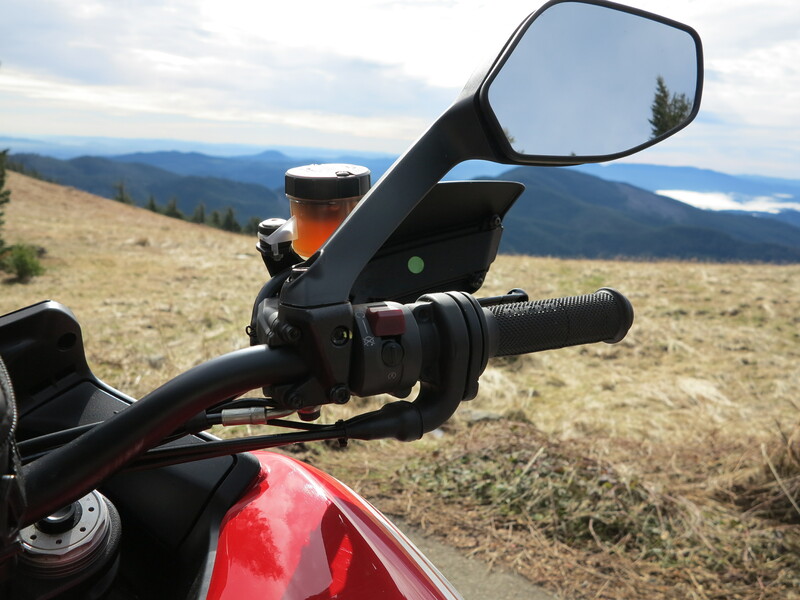 Do you always keep the Nuvi on the bike, or do you pocket it when you leave the bike for lunch or a hike? 3. Have you always used the Nuvi, or did you ever try/consider the Garmin Montana? I’ve never considered the Luna, will try it next, if I can get out of my Ona habit. I always keep the Nuvi on the bike when riding. It is so old and the maps are out of date, someone taking it would do me a favor and give me an excuse to get something else. I doubt anyone would want to take it, though. I thought about the Montana, but I like better the Navigatot V. In the end, I’m thinking of going the Nuvi route again, the 2597 is on my short list. 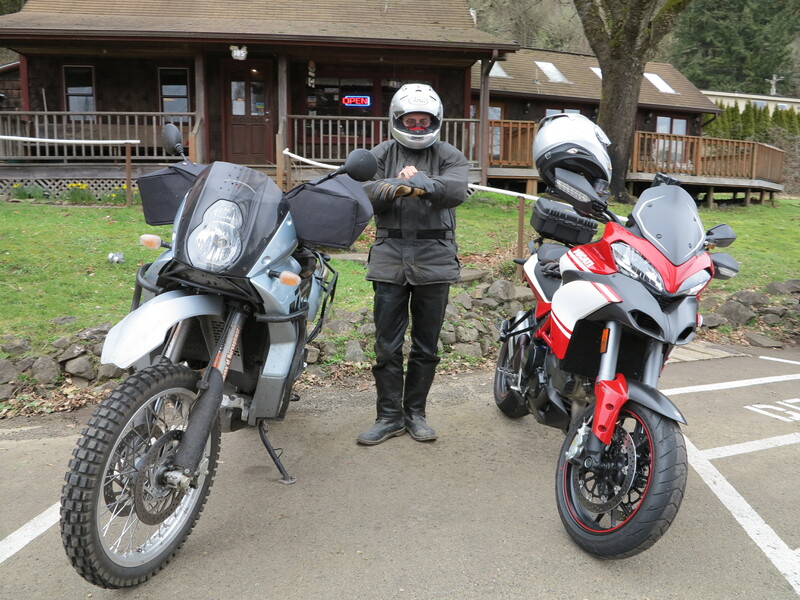 It is 1/3 the price of the Montana, 1/4 the price of the Navigator V. And since I have an old Oregon, where I can upload tracks when going off road on my other bikes, I’m thinking the Nuvi 2597 would complement it well for the rest of my navigation needs (gas stations, hotels, food). And it has blue tooth for smart phone connection and voice activate commands for when I use it in the car. 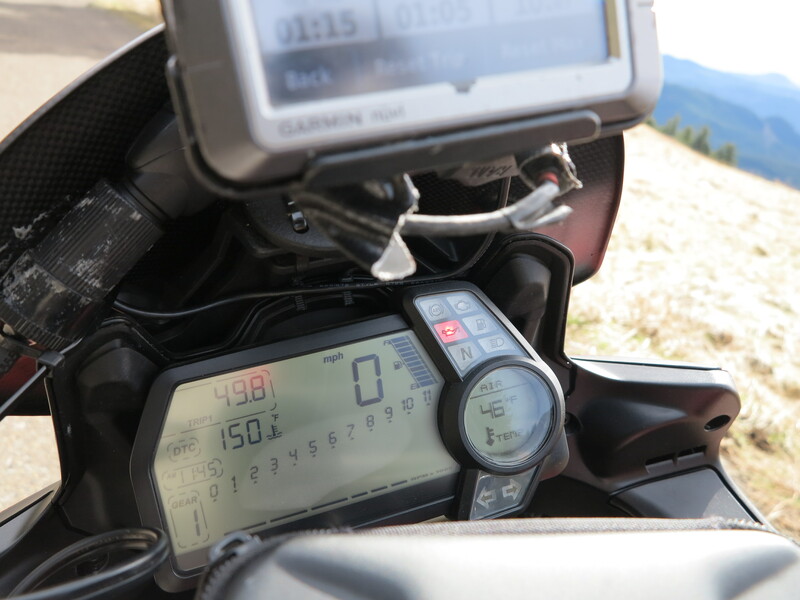 I think Garmin’s prices are too high for motorcycle dedicated tools. 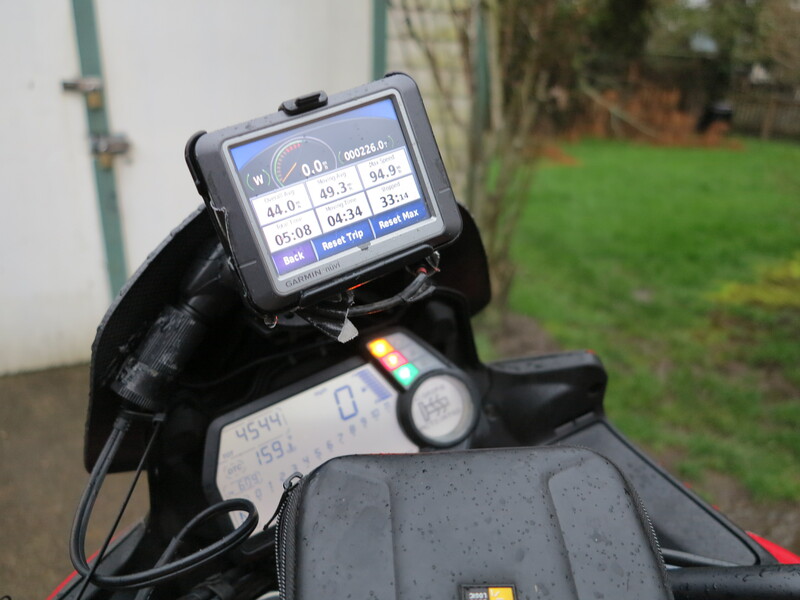 My Nuvi has survived being on my bikes through many miles in the rain and has never had a problem. I just use electric tape over the areas where water may get in (the SD car slot and the speakers). I used Gorilla tape to keep the the mini USB connection firm and protected from water). Ha brilliant video, I loved it. Looks like some great riding. Do you ever ride with Brad & Brandy? They look like they live nearby to you as I see some of the same pics on their blogs. Yes, great video! I don’t know if I’ve met Brad and Brandy, my memory for names it not very good. He means Brad and Brandy, aka Troubadour and Trobairitz, lol. We live in Corvallis, but have never met – why is that? Thank you for clarifying this Brandy! Oh well, now we know, now I know. Maybe one of these times when I’m passing through we will need to meet. 🙂 When is it again that you have the regular breakfast/brunch in Corvallis? Every Saturday morning a group of motorcyclists meet at Coffee Culture Annex on 9th Street in Corvallis from 9 am to whenever. Easy to find coming from the south end of town. Sometimes we are there until noon, sometimes people come and go and everyone is gone by 11. At least 4 of us try and be there by 9 every Saturday. All are welcome whether on two-wheels or 4 (in the bad weather). Would love to see you one Saturday. FYI – You and Brad (Troubadour) have met at one of Rod’s Steamboat rides but never knew of each other at the time. I think he had his Triumph America cruiser at the time. Thanks Brandy. I will stop by there the next time I go towards Corvallis, or go on my Pacific Coast loop.